The sounds, sights and activity of a construction site provide for endless fascination. 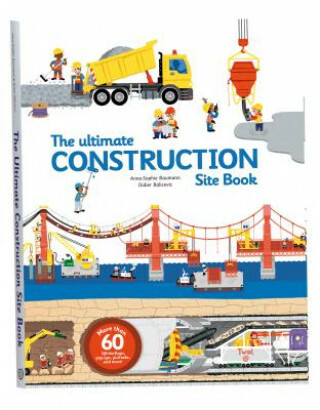 Packed with more than 60 tabbed moving parts to pull, lift and explore; crammed with meticulous detail of vehicles, buildings and techniques; here's a book that will satisfy even the most curious of kids. Whether it's building a bridge or a skyscraper, a giant ship or a tunnel, there's a wealth of colour, action and knowledge to be gleaned on each of the ten spreads of this oversized book. A wonderful companion to The Ultimate Book of Vehicles on the spring 2014 Twirl launch list.